Honey Sesame Pork Tenderloin is an easy family dinner recipe that’s perfect for busy weeknights. The pork is fully cooked in only 8 minutes on the grill! Grilling season is well underway and the options are endless. I love that we can cook outside without warming up the house. My neighbor is in his nineties and he even cooks lunch for him and his wife on the grill. This recipe for Honey Sesame Pork Tenderloin comes together fast and is sure to become a family favorite. Mix together kosher salt, coarse ground pepper, garlic powder, and ground cinnamon. Rub the spice mixture over a one pound pork tenderloin. Place the tenderloin in a pan, cover, and refrigerate for 30 minutes. Put the honey, soy sauce, olive oil, hoisin sauce, minced onion, minced garlic, sesame seed oil, and crushed red peppers in a sauce pan, whisk together, and bring to a boil over medium heat, stirring often. In a small bowl, stir together cold water and cornstarch and then slowly whisk it into the sauce. Continue cooking, stirring constantly until thickened. Put 1/4 cup of the sauce in a small bowl and set the rest aside. Bonus tip: If your sauce gets too thick, you can thin it by whisking in water, a little at a time until it reaches the desired thickness. Remove the pork tenderloin from the fridge and cut it into 1/2 thick slices. Brush the grill grates with vegetable oil and then cook the pork tenderloin medallions over high heat for 3 minutes on each side. Brush the pork tenderloin with the 1/4 cup of honey sesame sauce in the small bowl and grill an additional minute on each side to caramelize the sauce. The pork is fully cooked once it has reached an internal temperature of 145˚F. 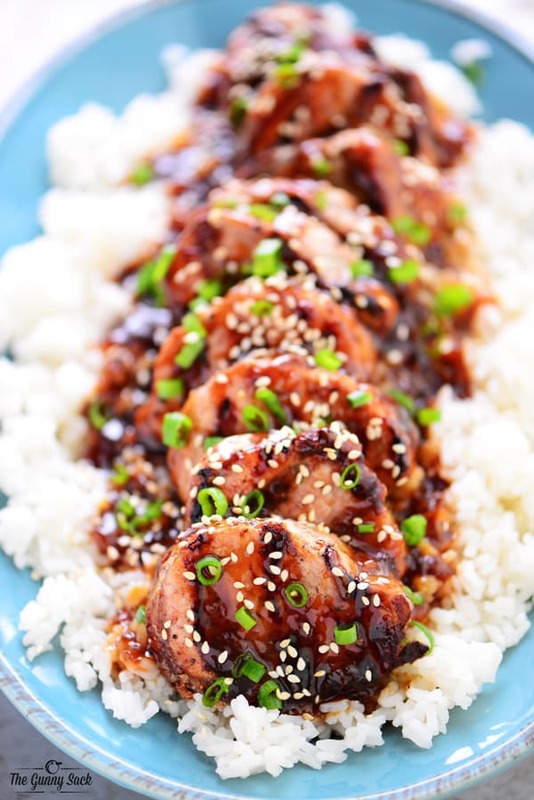 Serve the honey sesame pork tenderloin over rice with the reserved sauce, sprinkled with toasted sesame seeds and sliced green onions. 1. Can this recipe be made in the oven? Bake them at 350˚F for 12-15 minutes or until they reach an internal temperature of 155˚F-160˚F. 2. Can this honey sesame pork tenderloin be made on the stovetop? To saute the medallions in a pan, heat one tablespoon of olive over medium-high heat. 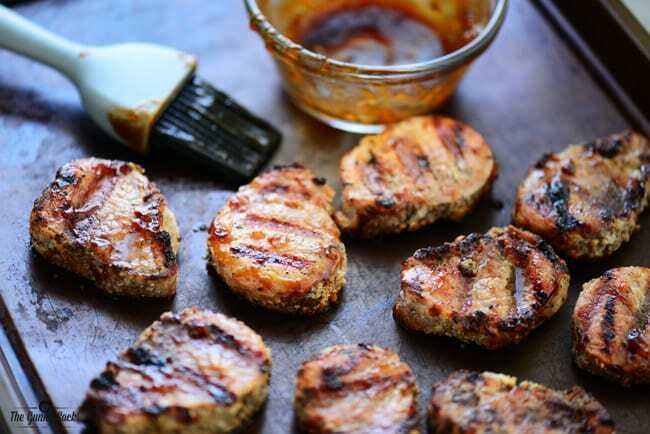 Cook pork medallions for 3-4 minutes per side or until the internal temperature reaches 155˚F-160˚F. 3. How long does it take to grill the WHOLE pork tenderloin, slicing it afterward? Grill the whole pork tenderloin over medium heat for 30 to 40 minutes or until it reaches an internal temperature of 155˚F-160˚F. 4. If I bake the WHOLE pork tenderloin and slice it afterward how long does it take? 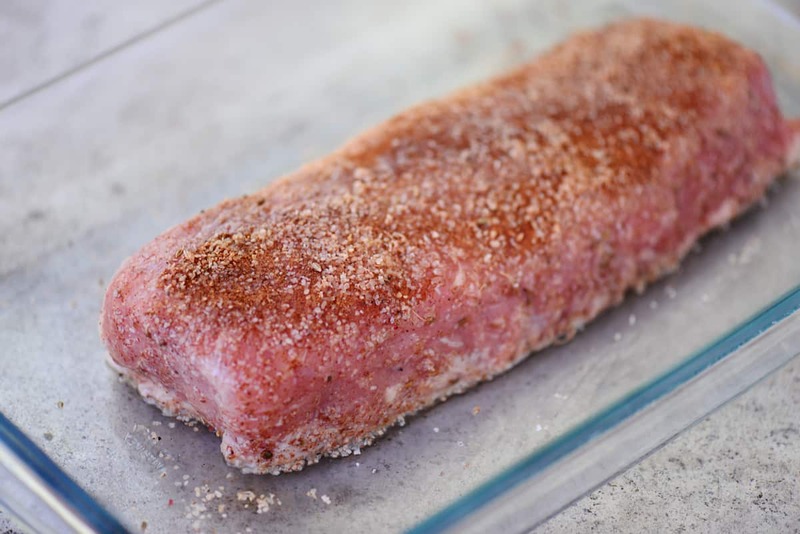 Bake the whole pork tenderloin at 425˚F for 30 minutes or until it reaches an internal temperature of 155˚F-160˚F. 5. 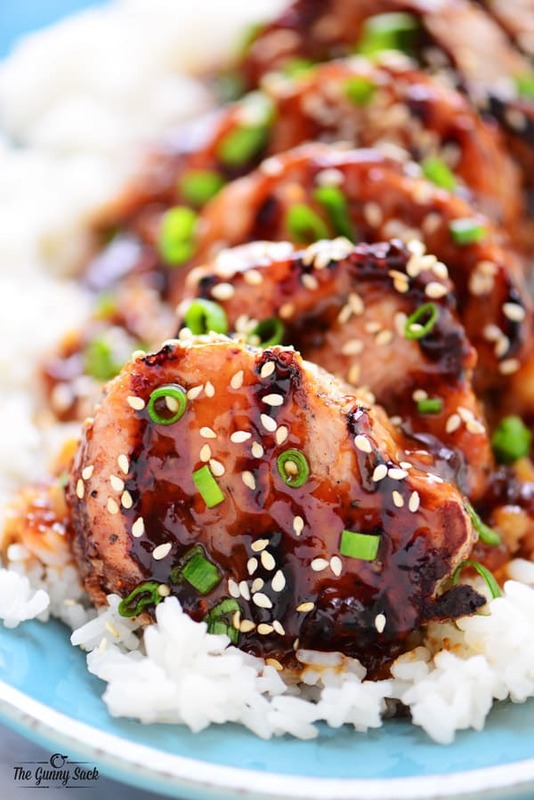 Do you have instructions for a slow cooker honey sesame pork tenderloin? Yes, cook it on low for 4-5 hours or until the internal temperature reaches 155˚F-160˚F. 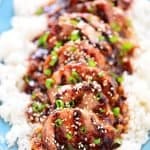 Slow Cooker Honey Sesame Chicken from The Gunny Sack: Slow Cooker Honey Sesame Chicken is a crockpot recipe that’s easy to make, cheaper than takeout and tastes better too! It’s a family-friendly recipe that will become a favorite. Honey Sesame Salmon in Foil from Cafe Delights: Honey sesame salmon in foil is ready in under 20 minutes! Full of Asian flavors with ingredients you have in your kitchen, and so easy to pull together! Honey Sesame Almonds from Beaming Baker: Sweet and smoky skillet-roasted almonds glazed with a coat of honey and satisfying sesame seeds. Honey Sesame Almonds are the new go-to snack. Slow Cooker Honey Sesame Meatballs from The Gunny Sack: Slow Cooker Honey Sesame Meatballs is an easy crockpot recipe that can be served for dinner or as an appetizer. This slow cooker recipe is full of flavor. Also, try this Garlic Rosemary Pork Tenderloin from The Gunny Sack: This garlic rosemary pork tenderloin recipe can be made on the grill during the summer and on the stovetop during the winter! It is a fast dinner recipe. Mix together kosher salt, coarse ground pepper, garlic powder, and ground cinnamon. Rub the spice mixture over the 1 pound pork tenderloin. Place the tenderloin in a pan, cover, and refrigerate for 30 minutes. 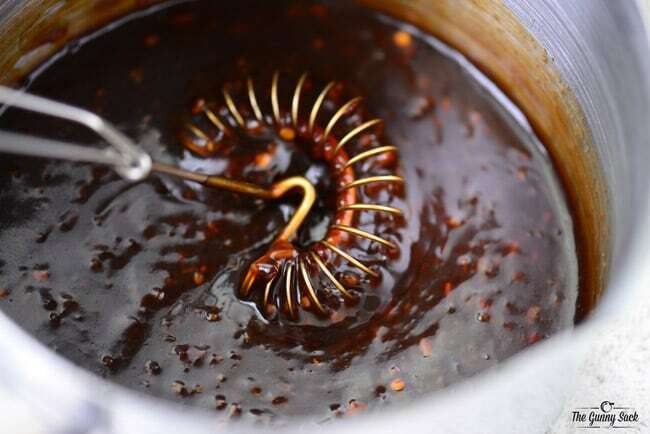 Put honey, soy sauce, olive oil, hoisin sauce, minced onion, minced garlic, sesame seed oil, and crushed red peppers in a sauce pan, whisk together, and bring to a boil over medium heat, stirring often. In a small bowl, stir together cold water and cornstarch and then slowly whisk into the sauce. Continue cooking, stirring constantly, until thickened. Put 1/4 cup of the sauce in a small bowl to bring out to the grill and set the rest aside. Remove the pork tenderloin from the fridge and cut it into 1/2 thick slices. Brush the grill grates with vegetable oil and then cook the pork tenderloin medallions over high heat for 3 minutes on each side. 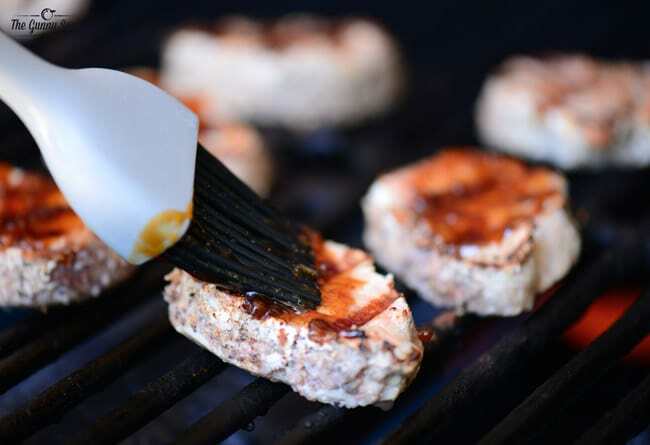 Brush the pork tenderloin with the 1/4 cup of honey sesame sauce in the small bowl and grill an additional minute on each side to caramelize the sauce. The pork is fully cooked once it has reached an internal temperature of 155˚F-160˚F. Before serving, top the pork tenderloin with the remaining sauce and sprinkle with toasted sesame seeds and sliced green onions. Bonus tip: If your honey sesame sauce gets too thick, you can thin it by whisking in water, a little at a time until it reaches the desired thickness. This dish was amazing! We loved it and will be in my rotation! I cooked slices of the pork in the oven. I think it kept the pork tender and moist. Great recipe! Thank you for sharing it with us. Wonderful recipe. It will be on the rotation for summer grilling. Loved loved loved this recipe…can’t wait until summer to use the grill! No grill….can I do this in the oven? Try baking them at 350 degrees for about 12-15 minutes or until they reach an internal temperature of 145. Or you can saute the medallions in a pan. Heat 1 tablespoon of olive over medium-high heat. Cook pork medallions for 3-4 minutes per side, until internal temperature reaches 145 degrees. I did the meat with potatoes, carrots and onion in a crock pot and used the sauce on top of the meat and as a sauce over each portion and it was FABULOUS! Loved this recipe. will make it again soon. This recipe is awesome – I also dear the whole tenderloin and roast in oven brushing with glaze…..yummmmm! Hi! At what temperature and for how long did it take to cook the whole tenderloin in the oven? 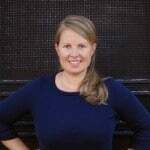 I couldn’t agree with you more Tonia. . .the best part of summer is GRILLING! Unfortunately, the hubby has be on business in Shanghai for the majority of the summer so I have not been able to enjoy grilled dinners (or lunches in the case of your neighbor) as much as I would have liked to. But this irresistible grilled tenderloin is making me want to fire up the grill STAT.